My boyfriends younger sister loves purple. If she had her way, most of her clothes would be some shade or another of purple. Since she has gone through a growth spurt recently, she had to get rid of a lot of her favourite dresses. So for her up coming birthday, I decided to make her something of a replacement. 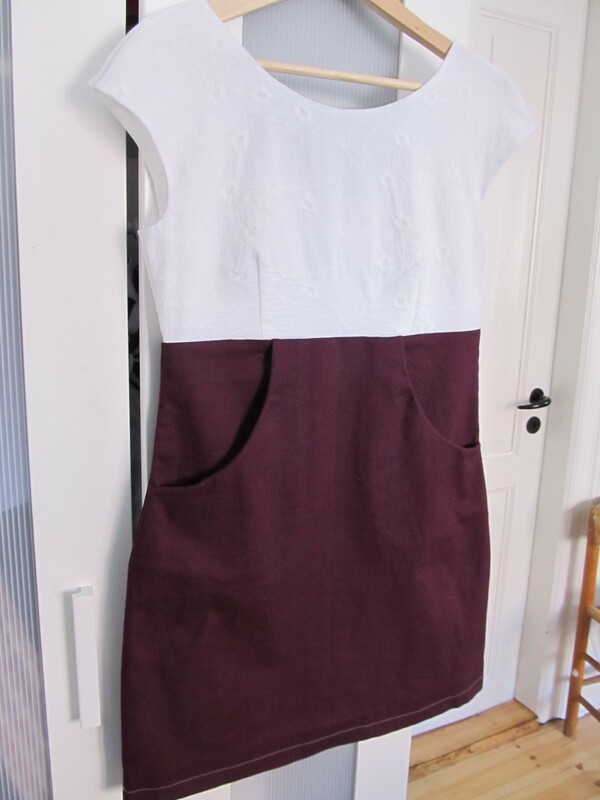 One aubergine and flower-y dress! When I went down to the fabric store, they were having a sale on cottons, which was perfect since it was exactly what I wanted. Despite the fact that I was starting the dress 2 months in advance, I felt this was destiny telling me “It’s ok, I will forgive you for buying MORE fabric”. The skirt is just a basic straight skirt that is fitted through the waist to minimize any possible balloon effects. It finishes about 5 cm above the knee on me, but since this budding 12-year-old is quickly out growing me, I thought it would be a good length in case she does get any taller and it won’t suddenly be too short. I added pockets too, because I love pockets and since she is still a kid, it’s good to have somewhere handy to stick things. They’re deep too to stop the dreaded “Oh no! I lost it! It must have fallen out of my pocket” moments. 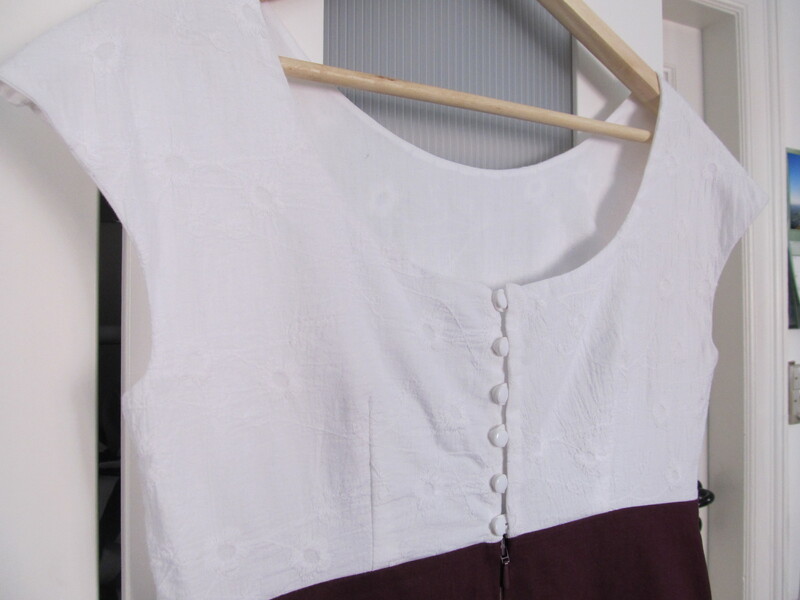 I used a light cotton canvas (again translated from Danish) that I’m finding I really like to sew with. It doesn’t drape at all but for pencil skirts or skirts like the one above, it’s perfect. The only problem is that it frays like, like….. something that frays a lot. Since I’m not really a big fan of zig zagging and a serger/overlocker is WELL out of my budget, I tested out using french seams. I know they probably aren’t meant for something this stiff and heavy, but they worked like a dream! No sign of fraying threads and a much tidier finish. I think they will become my seam of choice from now on. Pockets - nice and big! 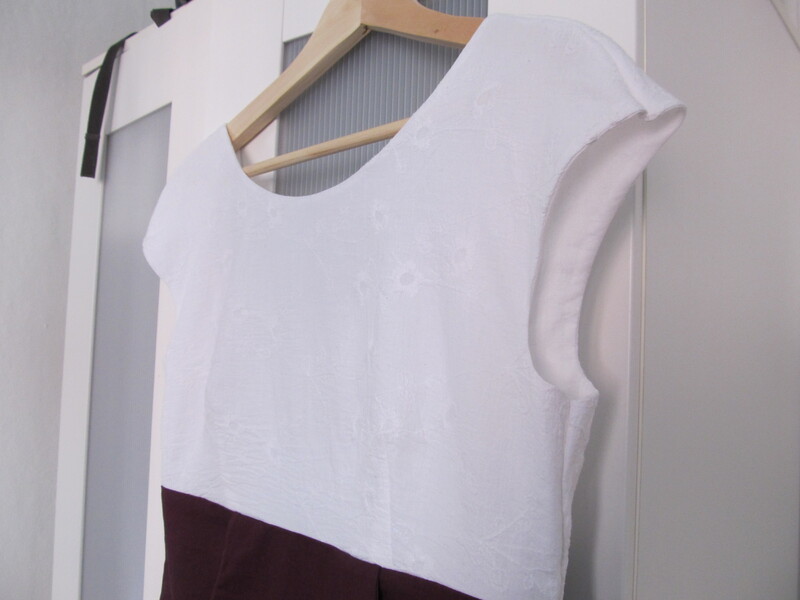 The top is from this one from Burda Style Magazine, I just left off the lower panels and voila! Empire line top ready to go. I also raised the front neck line since I had heard a lot about it being too low. I lowered the back neck line too. I’m quite liking the trend of high front neck lines, but lower back ones. It gives a dress a little somethin’ somethin’. I used embroidered voile that had these pretty flowers all over it. I lined the top with a plain light cotton so the voile wasn’t see through. 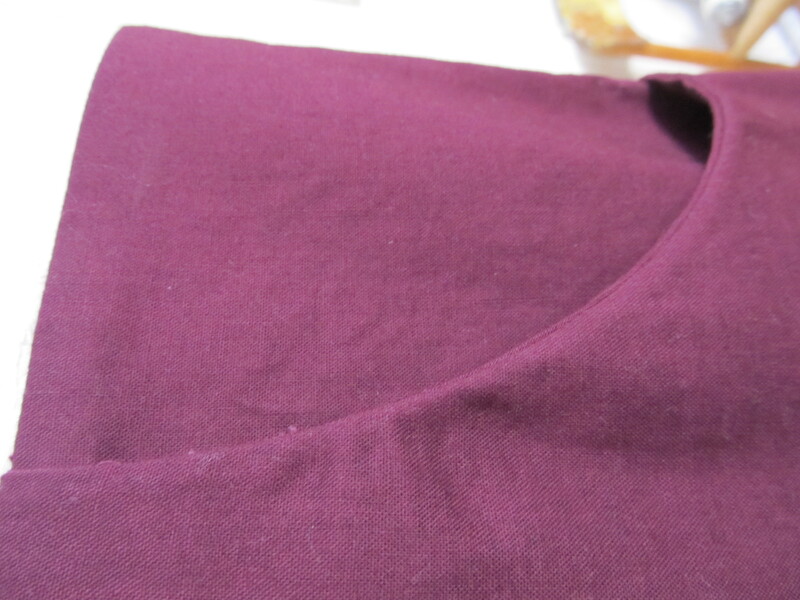 Since I lined the top, there was no need for facings and the neck line and sleeves looked really tidy. Despite the extra work that facings are, I think I will be using them a lot more since it just looks a lot nicer in the end. 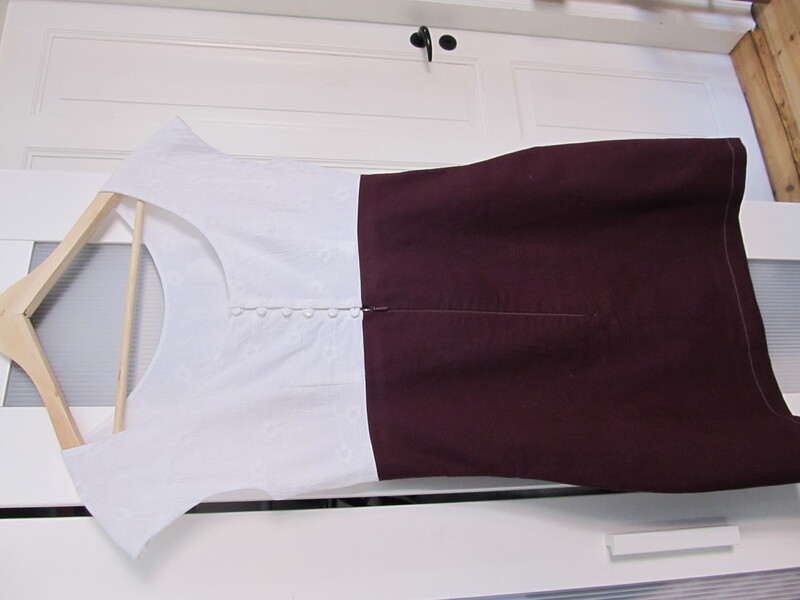 As you can see from the above photo, I used buttons to close the top and a zip for the skirt. The initial plan had been to use the zip right up the top as well, but the colour wasn’t exactly that of the skirt, so I thought it might look a bit out-of-place. The buttons are really nice and I’m glad I used them. 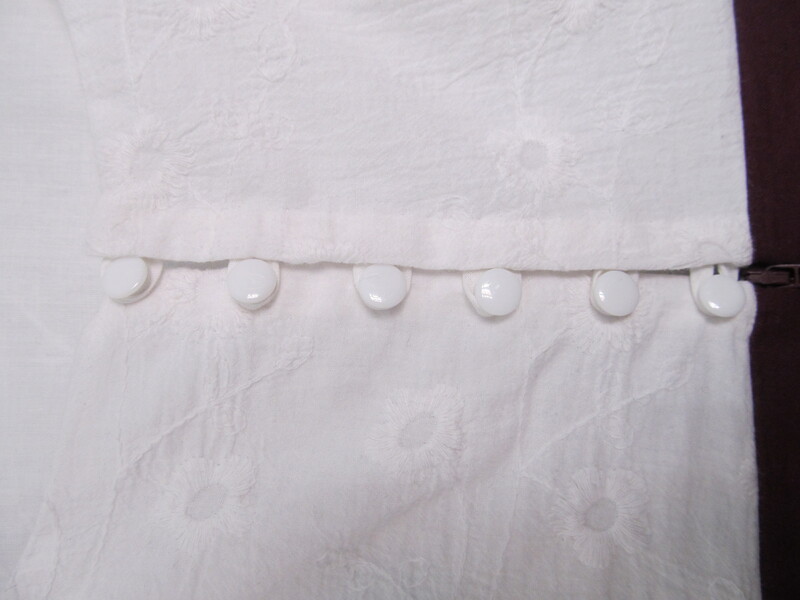 The only problem is is that I have this fear of going anywhere near a button-hole. I have no idea how to do them and my basic sewing machine doesn’t have that, now seemingly vital, function. I used bias binding to make button loops and they look good but I think I will need to get over my fear sometime or another and stop making loops. Maybe my next project will be the perfect opportunity! § 2 Responses to Oh Aubergine! You are currently reading Oh Aubergine! at A La Amelia.